While working on the data for my annual real estate forecast, I came across two real estate trends that strongly suggest 2013 is going to be a break-out year for the Tallahassee housing market. We know home values will still be under pressure due to all the short sales and foreclosures for sale in Tallahassee, as well as the wave of new distressed properties that will enter the market in 2013. 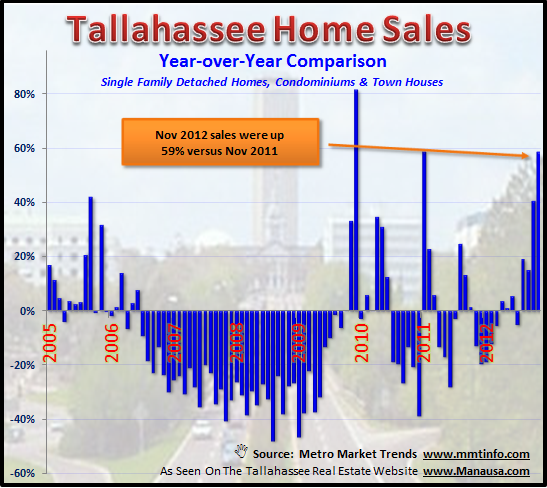 But these falling values, combined with historically low interest rates, might just push home sales in the Tallahassee MLS to levels last seen prior to 2009, and here are two real estate graphs that support this claim. One of the most important real estate trends that I like to monitor is the year over year home sales report. It compares a current month's tally of home sales with the corresponding month from the year prior to see whether there has been a non-seasonal change in the market. In the real estate graph above, we see that there were 59% more homes sold in November of 2012 than there were in November 2011, this is very strong. Moreover, November was the fourth consecutive month of gains and now there have been more homes sold in 2012 than there were in all twelve months of 2011. 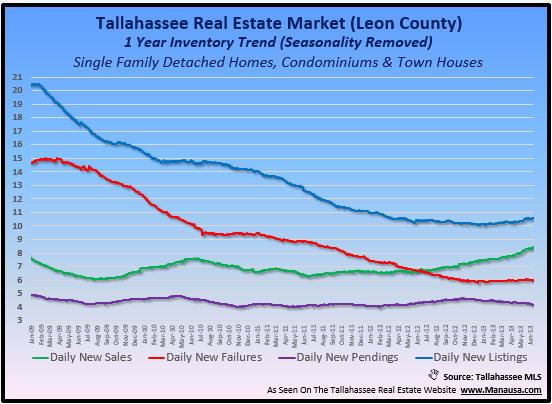 When we look at long-term real estate trends in Tallahassee, an interesting event is about to occur (interesting if you are a chartist :). For our long-term readers, you might recall an article in the past where we wrote about a stock market technical analysis applied to real estate trends. It showed how a "cross-over" could be a strong sign of a real estate cycle change. Well, the one year moving average is about to cross over the five year moving average, meaning that home sales over the past year are about to exceed the average number of home sales over the past five years. Of course, it hasn't happened yet, but it certainly looks imminent, doesn't it Steve? The first step is getting the one year trend to cross over the five and then the ten year trend. The next step is getting the five year trend moving higher and then crossing the ten year trend. All you have to do is stay tuned, it will be reported here (or you can subscribe to the Tallahassee Real Estate Newsletter) when it does occur. If you have a home to sell, these real estate trends indicate that you will have both good news and bad news in the months and years to come. First of all, there will be more potential buyers for your home, so that is good. Unfortunately, there will also be more home seller competition, and much of it will be coming from people needing to do short sales and banks unloading foreclosures, and this is bad news. Our home seller advice for 2013 is no different than the advice we've been publishing for the past 6 years. If you want to sell a home, sell it now and sell it fast to get the top dollar for your home, or plan on waiting years until values return to higher levels. If you would like to know how the current real estate trends specifically impact your home's value, just drop me a note and we can schedule a time to meet and address your specific situation. Thank you Joe. Agreed about public opinion, but media perspective won't flip upside down homeowners right side up any time soon.